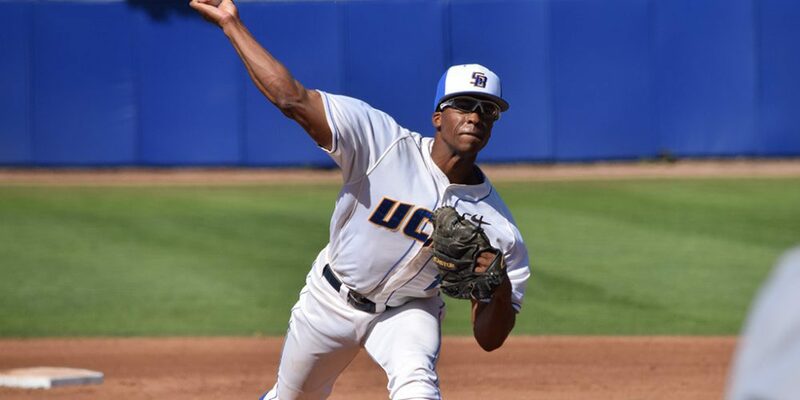 SANTA BARBARA, Calif. — Would UC Santa Barbara righthander Dillon Tate live up to the hype? That was the all-important question I pondered while making the two-hour plus drive from Los Angeles International Airport to the quiet riviera-like abode of beautiful Santa Barbara. In this truly Utopian paradise nestled in Southern California, it’s easy to not know who Dillon Tate is. At dinner Thursday night, a few locals asked me — obviously realizing I wasn’t a local with my Texas-heavy accent — what exactly brought me to Santa Barbara if it wasn’t a vacation. The answer was simple: to see Dillon Tate. Some locals knew UCSB had a good baseball team, but for the most part, shoulders were shrugged when the name “Dillon Tate” was said. Baseball fans or not, everyone should be interested in someone who perfects his craft like Dillon Tate has for the Gauchos this season. Tate, a 6-foot-2, 185-pound, junior righthanded pitcher, has blossomed into one of the hottest, if not the hottest commodity in college baseball, and for the upcoming draft. And for good reason. Duke’s Michael Matuella went down with a season-ending injury earlier this week, and Tate is ahead or right there with other premier arms such as Virginia’s Nathan Kirby, Louisville’s Kyle Funkhouser and Vanderbilt’s Walker Buehler. In essence, Tate has a real chance to be the first overall pick in the draft if he continues to pitch the way he did in a victory over Fresno State, though some out there feel like prep star and Florida State commitment Brendan Rodgers is the favorite to occupy that role by default. It’s extremely difficult to meet the expectations that have been placed on Tate the past few weeks, as scouts just continue to flood UCSB’s campus. But even on a day when he thought — at least before the game — he wasn’t quite in a groove, he looked terrific and like 1-1 material against the Bulldogs, striking out eight, walking just one, and allowing just a run in a complete-game performance.